We discovered when God talks about the wise and understanding, He is referring to those who fear Him. We want to pick up from where we left off and continue LOOKING at the fear of the Lord is wisdom. Lord, we come to You today because we love You Lord, and we want to know You. We want to understand Your will and ways. Help us today to see what You are saying to us, and grant us the understanding we need to apply these Truths to our lives. Thank you! Read James 3:13-18, asking the 5W’s and H to put you in context. Read out loud, as saying it and hearing it helps you remember it. Our focus is on verse 13, regarding wisdom and understanding. Why is the fear of the Lord key? Let’s pick up where we left off yesterday! 1. What is ‘the fear of the Lord’? What is ‘the knowledge of the Holy One’? Understand: The fear of the Lord opens up wisdom. Understand: The FOL is the source and foundation of wisdom. Understand: NO one can be wise until they fear the Lord. Understand: Understanding is not only departing from evil, as we saw earlier, but it is ‘knowledge’ of the Holy One. Understand: To know God, the Holy One [understanding] is to fear God [wisdom]. What do I know, understand, about God, the Holy One? Do I know and recognize the Holy One is 3 Divine Persons in the Godhead, the Father, the Son, and the Holy Spirit? Do I recognize God for Who He is? The Judge. (Jam 4:12); (Rev 20:11-13)? 2. What does Proverbs tell us about ‘the fear of the Lord’? 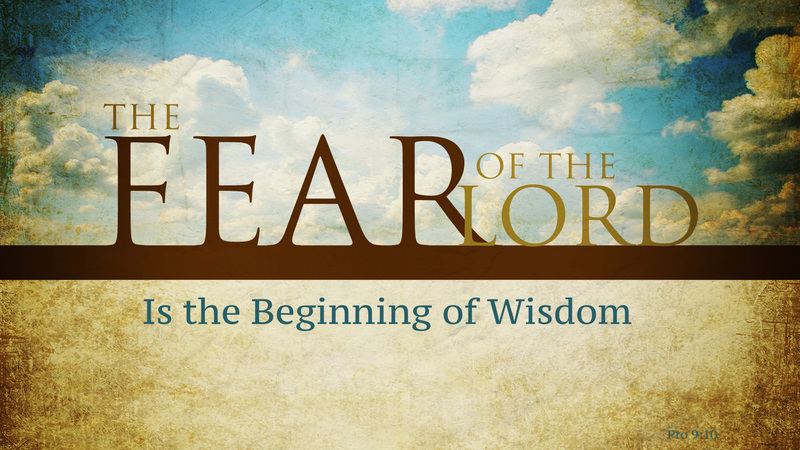 We see: The fear of the Lord is not only the beginning of wisdom but also of knowledge. We see: It is said to be the foundation and source of knowledge; it opens up knowledge; without which all other knowledge is vain and useless. Understand: Any other knowledge is empty and not at all profitable in time of affliction; in the hour of death; and at the day of judgment. We see: Fools live without taking God into account. They are not capable of having wisdom and understanding (knowledge). Do I despise wisdom, instruction and knowledge? Why? Do I refuse to take God into account when I make choices and decisions, even when I speak? 3. What else does Proverbs tell us about the fear of the Lord? Do I have a rich and meaningful life? What is the evidence to others that I hate evil? 4. From Romans, what do you learn about those who do NOT ‘fear the Lord’? They are ungodly, unrighteous, and suppress the Truth. We see: Those who do NOT fear the Lord give themselves increasingly to evil. What does my character, conversation and conduct reveal? Am I a fool, professing to be wise, but my heart is darkened, and I am giving myself increasingly to evil? 5. Who was ‘God fearing’? 6. What do those who fear the Lord, with a good understanding (knowledge of God), who are wise, do? We see: It isn’t the one who just hears, or says, but it is the one who does the Word of God. Understand: Knowledge and wisdom begin when we fear the Lord. Understand: When we fear the Lord, we have a good understanding, a knowledge of God, that causes us to respond to Him in obedience. Do I just hear? Or, do I hear and do? Do I respond to God in obedience? God loves you, take the time to have a good chat with Him! Typing what you have LEARNED helps you bury Truth down deep into your head and heart. OH FATHER GOD, YOU WHO ARE HOLY AND RIGHTEOUS, SO MAJESTIC, we bow before You today with praise for who You are. Oh Father, wisdom begins with a fear of You and the knowledge of You! May we fear You when we sin, and Father, may we love You, honor and respect You, adore You and be in awe of You. Oh, make it our priority to know You, to know Your will and Your ways. And may it not stop there Father, but may You give us the skill, the ability to take that knowledge and understanding of You and apply it to our lives! In that knowledge, that understanding, may we commit to ‘depart’ from – ‘turn’ from – ‘hate’ evil. May we truly hate anything and everything that is bad in a moral and ethical sense! May we examine our hearts today! May we not be fools who despise wisdom, instruction, and knowledge. But rather, knowing that Your wisdom is equated with fearing You, may we truly fear You Father God! I pray that all on this journey in James have received Your wisdom from above, that can only come from You. We ask this in Jesus name! Amen! Next: we will LOOK at how to get God’s wisdom.